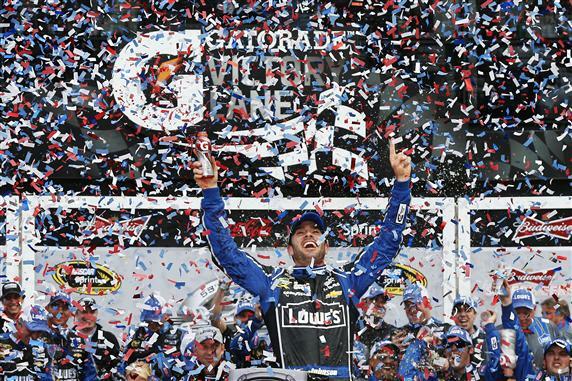 DAYTONA BEACH, Fla. (Dec. 19, 2013) – Jimmie Johnson took a giant step toward joining NASCAR’s pantheon of legends. And he did it in the NASCAR Sprint Cup Series™ Gen-6 race car, which made its debut in record-setting fashion. To say the least, 2013 was a very big year. Johnson, whose run of five consecutive NASCAR Sprint Cup championships ended in 2011, regained his winning form. His “six pack” of titles is one fewer than the seven championships won by NASCAR Hall of Famers Richard Petty and Dale Earnhardt – a record the 38-year-old El Cajon, Calif., competitor will stalk in 2014. Johnson won his second Daytona 500 and became the first competitor since 1982 to post a season sweep at Daytona International Raceway. The Gen-6 car, a collaborative and far-reaching initiative undertaken by NASCAR, Toyota, Chevrolet Division of General Motors and Ford Motor Company to put the “stock” back in stock car, provided close, competitive racing. The season saw 19 track qualifying records broken; a record number (127,306) of Green Flag Passes; and the lowest Margin of Victory (1.267 seconds) since 2005. Twenty races ended with a margin of victory of less than one second, up from 17 in 2012. Seventeen different drivers – including five who had gone winless the previous season – went to Victory Lane, two fewer than the series’ modern era record. Jimmie Johnson: With four victories, Johnson led the points standings after all but three of the regular season’s 26 races. The Hendrick Motorsports driver, however, started the Chase for the NASCAR Sprint Cup™ as the No. 2 seed behind Matt Kenseth. Victories at Dover International Speedway and Texas Motor Speedway enabled Johnson to keep pace with and then pass his rival. The only driver to qualify in all 10 years of the Chase era, Johnson posted an average finish of 5.0 in the 2013 Chase to edge Kenseth by 19 points. Johnson’s championships have come in three different generations of NASCAR Sprint Cup cars. Matt Kenseth (Honorable Mention): Many felt 2013 would be a learning year as Kenseth transitioned from driving a Ford for Roush Fenway Racing to piloting a Toyota for Joe Gibbs Racing. Kenseth and crew chief Jason Ratcliff, however, jelled from the first Daytona 500 practice, in which Kenseth led 86 laps before his No. 20 Toyota succumbed to engine failure. He won a career-best seven times, including the first two races of the Chase. Kenseth led the Chase after six of its first eight races before handling issues and a 23rd-place finish at Phoenix International Raceway effectively doomed his hopes for a second NASCAR Sprint Cup title. Kurt Busch: Two seasons after his release from Penske Racing, Kurt Busch’s career has risen from the ashes thanks to a gritty performance behind the wheel of the No. 78 Furniture Row Racing Chevrolet. Busch didn’t win, but he did just about everything but. He wheeled the Denver, Colo.-based organization into the Chase, the first time a single-car team has qualified for NASCAR’s postseason. Busch finished 10th in the final standings with a solid log of 11 top-five and 16 top-10 finishes. The performance earned Busch a spot in a fourth Stewart-Haas Racing Chevrolet for 2014. Kyle Busch (Honorable Mention): After a lost year in which he failed to qualify for the Chase, Kyle Busch roared back in 2013 to make his strongest bid yet for a premier series championship. He won four times during the regular season and finished second to Joe Gibbs Racing teammate Kenseth in the opening two races of the Chase. A 34th-place finish at Kansas Speedway ended Busch’s title hopes but his fourth-place overall ranking is the Las Vegas native’s best since becoming a full-time NASCAR Sprint Cup competitor in 2005. Busch posted 22 top-10 finishes and won three poles – each a season best. Hendrick Motorsports: Rick Hendrick again qualified all four of his drivers – Johnson, Earnhardt, Jeff Gordon and Kasey Kahne – for the Chase for the NASCAR Sprint Cup. Johnson produced the organization’s 11th NASCAR Sprint Cup championship and won six times. Kahne won twice. Gordon extended his reign as the series’ active win leader with his 88th career victory in October’s Chase race at Martinsville Speedway. Earnhardt failed to find Victory Lane but his 10 top-five finishes were a season best in a Hendrick Chevrolet, which matched his top output of 2004. Joe Gibbs Racing (Honorable Mention): Coach Gibbs’ three drivers – Matt Kenseth, Kyle Busch and Denny Hamlin – gave JGR the most victories among team owners in 2013. Their combined total of 12, led by Kenseth’s seven victories, represented a .333 winning percentage over the season’s 36 races. Kenseth entered the Chase with the No. 1 seed. Kenseth and Busch ranked one-two through the first two races of the postseason before finishing second and fourth, respectively, in final points. It marked the first time since 1999 that two JGR drivers ranked among the top five overall. Joey Logano: In his first season with Penske Racing, Logano upstaged his new teammate, reigning NASCAR Sprint Cup champion Brad Keselowski. Logano qualified for his first Chase for the NASCAR Sprint Cup, while Keselowski became just the second champion during the Chase era to fall short of postseason qualification. The Connecticut native won for the first time in the No. 22 Ford in August at Michigan International Speedway. He posted season bests in overall finish (eighth), top fives (11) and top 10s (19) and laps led (323). Brian Vickers (Honorable Mention): Once tabbed a “can’t miss” prospect after winning a NASCAR Nationwide Series championship at age 20 and a pair of NASCAR Sprint Cup races, Vickers’ career had been stymied by illness. Vickers latched onto a part-time job with Michael Waltrip Racing in 2012 and finished three of eight races among the top five. This year saw Vickers take the team’s No. 55 Toyota to Victory Lane at New Hampshire Motor Speedway – confirming his status as the car’s full-time driver in 2014. Aaron’s 499 at Talladega Superspeedway, May 4 – Often a back-and-forth affair, this May’s race at Talladega Superspeedway lived up to the track’s reputation. It also provided the surprise winner of the 2013 NASCAR Sprint Cup Series season – David Ragan. Ragan, who had previously won at Daytona International Speedway driving for Roush Fenway Racing in 2011, was pushed to victory by his current Front Row Motorsports teammate David Gilliland. It was Front Row’s first victory in NASCAR’s premier series. Auto Club 400 at Auto Club Speedway, March 24 (Honorable Mention) – Kyle Busch was the benefactor of all-or-nothing beating and banging on the final lap between Joey Logano and Denny Hamlin during March’s race at Auto Club Speedway. As Logano and Hamlin traded paint for the win – a battle that caused both to wreck – Busch came on the outside to steal the victory. The Gen-6 race car produced 41 green flag passes for the lead during this one, tying the track record at the Southern California two-miler. IRWIN Tools Night Race at Bristol Motor Speedway, August 24 (Honorable Mention) – Bristol’s annual night race is a spectacle – the perfect stage for late-race drama. During the 2013 edition, Matt Kenseth and Kasey Kahne battled side-by-side in the closing laps. The edge-of-your seat action led to the fourth-closest margin of victory of the season, with Kenseth narrowly beating Kahne to the line.